What’s Worse – A Lying Lawyer or A Stupid, Greedy One? In this bizarre story, Attorney Punished for False Promises, Adam Kovac, Daily Herald (2/26/05) concerning a disciplinary action brought against attorney Cynthia Sutherin who duped her co-workers into joining what turned out to be a fictitious law firm, I couldn’t help wondering whether the wrong attorney had been charged. After all, if Sutherin’s conduct, i.e., her lack of truthfulness, would disqualify her from legal practice, why shouldn’t the other attorneys’ conduct, i.e., failure to engage in due diligence before quitting their jobs to join Sutherin’s firm, disqualify them from practice as well? According to the article, here’s what happened. [Editor’s note – we have not yet been able to access the underlying opinino] Cynthia Sutherin, formerly an attorney in the Kane County Public Defender’s Office told colleagues that she had $5.2 million to fund her new law firm and had procured contracts with two cities to prosecute misdemeanors. Also according to the article, Sutherin promised colleageues to salaries and expensive cars in exchange for coming on board. When the firm that Sutherin had described failed to materialize, she claimed that she’d been diagnosed with cancer which prevented her from going through with starting a firm. Though the article doesn’t so state, I’m guessing that Sutherin’s disgruntled colleagues turned her into the bar. The disciplinary arm of the court recommended a two year suspension but is allowing Sutherin to work as an attorney while she remains on probation and receives counseling and complies with other conditions of the court order. I have to admit that I’m not quite sure how Sutherin’s conduct reached the disciplinary level to begin with. When employers want to make hires, we often exaggerate – for example, if I want to hire a law clerk, I’ll focus on the interesting and exciting matters that my firm handles and avoid details of the grunt work that a clerk will likely receive. Now, Sutherin’s exaggerations appear to have been outright lies – but where do lawyers cross that line from puffery to falsehood? And why should the the bar draw that line anyway in situations where clients aren’t involved. Personally, I view bar intervention as warranted only where an attorney’s lies in a non-client context are of such a pathological nature or comprise part of a constant pattern of deception that they can be used as evidence that the attorney is so prone to dishonest conduct that he or she would eventually do harm to a client. But here’s my real beef. If dishonesty, outside the context of an attorney-client relationship is grounds for disbarment, why isn’t greed and incompetence? After all, what were those lawyers who left their job thinking when a former public defender claimed to have $5.2 million to start a firm? Did those lawyers think it was a wise business move to work for an attorney who offered to buy them them BMW’s rather than reinvesting the money back in the firm? Did the lawyers ask whether Sutherin had a business plan for further growth of the firm or office space or even a website? Were they at all concerned that a former public defender who I’m assuming had no previous experience running a law firm would be capable of launching a practice that would succeed from the start? Did they try to negotiate some kind of written employment agreement? At best, the duped attorneys were guilty of simple incompetence in failing to protect their own interests and at worst, of allowing the lure of fancy cars and high salaries to obscure their good judgment. Surely, we don’t want that kind of attorney in practice any more than a dishonest one. So why weren’t those attorneys subject to discipline also? As a final note, if you read between the lines (something that we at MyShingle do for you!) 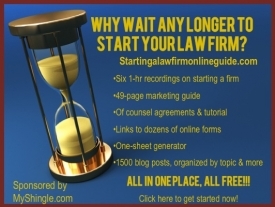 this article reveals an important lesson for attorneys starting out on their own. As you investigate your options in solo practice, you may be confronted by unscrupulous attorneys who’ll promise all kinds of overflow work if you rent the pricy office in their suite or will offer you a “sure thing” contingency (in exchange for a 20% referral fee) that turns out to be a dog. Examine all of the possibilities that come your way as diligently and thoroughly as if you were doing it for your client. If an opportunity sounds too good to be true – as was the case here – sadly, it probably is.